Solitary stout rattan climbing to 7 m tall; stem without sheaths to 25 mm diam., with sheaths to 50 mm diam., internodes short, c. 50 mm long. Sheath bright green, armed with robust brown spines to 25 × 4 mm, scattered or arranged in partial whorls, pale brown hairs abundant between the spines, spines around the sheath mouth large, crowded, ± horizontal, 20-50 × 4 mm; knee absent; ocrea soon tattering. Flagellum absent. 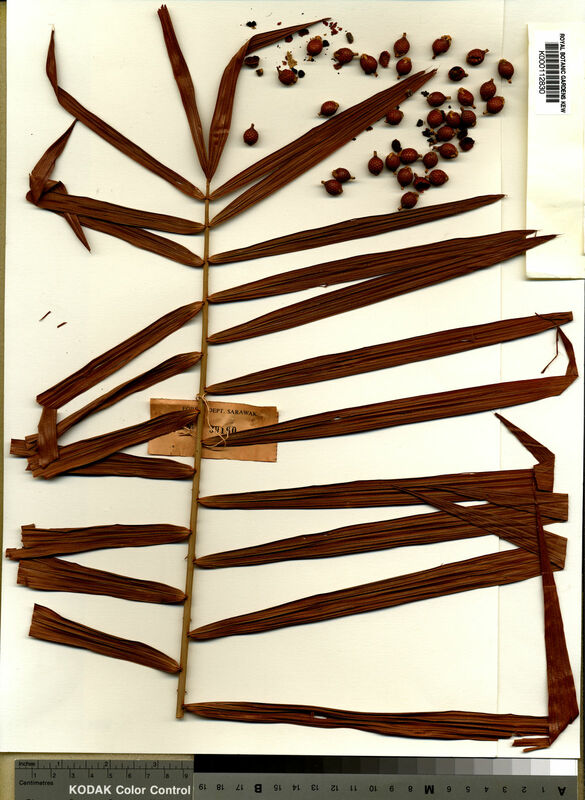 Leaf ecirrate, to 3 m including petiole; petiole to 1.5 m, armed laterally with regular horizontal spines, 20-50 × 4 mm; leaflets regularly arranged, 40-75 on each side of the rachis, stiff, narrow, linear, the longest in mid leaf, c. 50 × 2.5 cm, the apical divaricate, c. 12 × 1 cm, drying dull reddish or dirty brown, the lower surface with short regular bristles on 3 nerves. Inflorescences 1-1.5 m long or more, arching; prophyll very robust, armed with lateral groups of spines and abundant tomentum, expanded apically to form a tattered limb at least 15 × 4 cm, bearing abundant long brown spines 10-40 × 3 mm; primary bracts tubular at the base, splitting and expanded to form spiny limbs, the whole bract frequently longer than the inflorescence; male rachillae distichous, rather crowded, ± reflexed, to 12 ×2 mm; female rachillae distichous, stiff, ± reflexed, 20-50 × 4 mm; rachilla bracts very hairy. Mature fruit ± broad ellipsoid, 10 × 8 mm, beaked, covered in 18 vertical rows of chestnut brown scales. Solitary or densely clustering acaulescent rattan; stem subterranean or decumbent, scarcely exceeding 40 cm long, c. 15-20 mm diam without sheaths, with sheaths to 30 mm diam. ; internodes very short, scarcely more than 3 cm long. 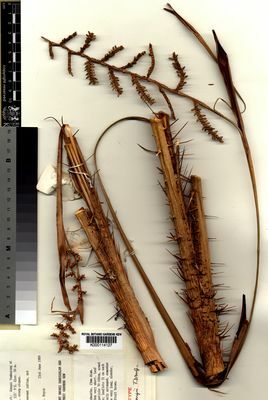 Leaves ecirrate, 1.8 - 3 m long; sheaths green with pale green spines when fresh, drying pale reddish brown throughout, rather densely armed with scattered and grouped flattened, narrow triangular spines, 5-23 × 1-3 mm, held horizontally or upward-pointing, spines around the leaf sheath mouth more crowded but scarcely differing from the rest, pale brown indumentum abundant between the spines; petiole 70 - 150 cm long, c. 7 mm wide near the base, armed basally with two rows of evenly spaced, conspicuous flattened, pale brown spines 25-45 mm long, c. 2-3 mm wide at the base, c. 2 - 4 cm distant, and scattered much shorter spines, distally the petiole only very sparsely armed; rachis somewhat arcuate, ± unarmed, bearing 21-28 somewhat divaricate regularly spaced leaflets on each side, the longest to 45 × 2.5 cm in mid leaf, the apical leaflets to 20 × 1.3 cm, leaflets conspicuously 3-veined on upper surface, sparsely armed with short bristles along the main vein on the under surface only, transverse veinlets sinuous. Inflorescences staminate and pistillate superficially similar, the staminate branching to 3 orders (and known only in mummified state), the pistillate branching to two orders and with 2 partial inflorescences only; peduncle arcuate, c. 80 cm long; prophyll c. 60 × 0.4-0.5 cm, with short narrow lanceolate flattened limb 11-20 × 1.8-2.2 cm, unarmed throughout; peduncular bracts much shorter, split down much of their length, the flattened limb to 13 × 1.5 cm; staminate partial inflorescence to 12 cm, staminate rachillae very poorly preserved; pistillate partial inflorescence to 23 cm, with up to 6 or 7 distichous rachillae on each side of the first order branch; bracts on first order branch 7×3 mm tubular, truncate, unarmed, bearing thin brown indumentum; rachillae reflexed, the longest at the base of the partial inflorescence, usually not exceeding 1.5 cm but sometimes to 5 cm, 2 mm diam., bearing strictly distichous dyads; rachilla bracts strictly distichous, crowded, triangular, striate to 2.5 × 2.5 mm, drying with slightly undulate margins, the abaxial surface with scattered brown scales; involucrophore and involucre similar to rachilla bract, scarcely explanate. Sterile staminate flower bud c. 3 × 2 mm; calyx to 3 × 2 mm, striate, glabrous, tubular in the basal 2.5 mm; petals smooth, c. 2 × 1 mm; staminodes 1× 0.2 mm. Pistillate flower just post anthesis to 5 × 3 mm; calyx to 3 × 3 mm, tubular in the basal 1.5 mm, with three triangular lobes, striate, glabrous; petals smooth, glabrous, to 4×1.5 mm; staminodal ring to 1 mm; ovary cylindrical to 2.5 × 2, stylar region 2 × 2 mm, stigmas reflexed to 2 × 0.5 mm. Immature fruit rounded, c. 5 mm diam., with a conspicuous cylindrical beak to 2 × 1 mm, tipped with the stigmatic remains; pericarp covered in c. 17 vertical rows of shiny chestnut brown scales. Seed very immature, with homogeneous endosperm. bracteis inflorescentiae Sectionem Platyspatham Furtado pertinens, C. baculari et C. sabalensi affinis, sed habitu decumbenti, spinis vaginae foliorum, dispositione foliolorum et rachillis pistillatis brevibus crassis differt. Known only from Temburong where it is a common rattan of the forest undergrowth at Kuala Belalong. Endemic to Brunei.